The bees have filled only approximately half of the box with brood and stores. September is almost over. In my latitude that means that the bees have at most one brood cycle left (a worker brood cycle is approximately 20 days) and the bees are heading into winter with a box that is way too big for their population. What can we, the beekeepers do to help them out? First things first, we need to determine what happened. Take a peek at the frames with brood and stores in your hive. Do they look normal or is there a cause of concern? Check out my post Fall Inspection for my nucs and singles for pictures of what brood and stores look like this time of the year. Do you suspect that high varroa mite levels are making it hard for your bees to maintain a healthy population? The ScientificBeekeeping site has a lot of resources on varroa and testing for varroa levels. You can find the info here. Maybe your hive has a dwindling population due to laying workers. You can find out what laying workers hive looks like here. Maybe you have a poorly mated queen or a drone layer. Examples and treatment options can be found here. Maybe the flow stopped unexpectedly and you are seeing the last super that the bees could not complete. In this case, the boxes under this one should be full of brood and stores. Maybe you were throwing supers on a bit too fast for them and the bees created a tall and narrow "chimney" of brood and stores right in the middle of the boxes and left the outside frames bare. Maybe you got a little bit too enthusiastic stealing brood for your nucs in late summer and your hive did not have enough time to rebuild. This is my mistake that caused my hive to look like the picture above. Maybe a myriad of other things happened that prevented your colony from building up. After making sure that #1 and #2 from the above list are covered, you need to make sure you have enough stores and provisions. The Canadian Association of Professional Apiculturists (CAPA) has published a lot of research on wintering bees on their website. Their recommend minimum wintering weight is 95 lbs. for singles and 135 lbs. for doubles with stores taking up 55 lbs. and 70 lbs. respectively. In particular, that translates roughly to 5 heavy honey frames, 2 frames of pollen and 2 frames of mostly capped brood for singles and 10 heavy honey frames, 4 frames of pollen and 4 frames of mostly capped brood for doubles. Their recommendations have worked well for me in the past 4 years. As you go through your hive, take inventory of their resources. Is the bee population along with the existing brood and stores better suited for a single, a double or even a nuc (1 frame of brood, 1 frame of pollen and 2 heavy honey frames)? By the time you are done with your inspection, you should have a pretty good idea what size box would be optimal for the current cluster size. If you have an appropriate box handy, you could just transfer the frames into the new box, put it on the stand, close it up and call it a day. Make sure you keep the brood frames in the middle, with the youngest brood (eggs and open brood) in the center of the brood nest, the capped brood towards the periphery of the nest and the honey frames on the outside. 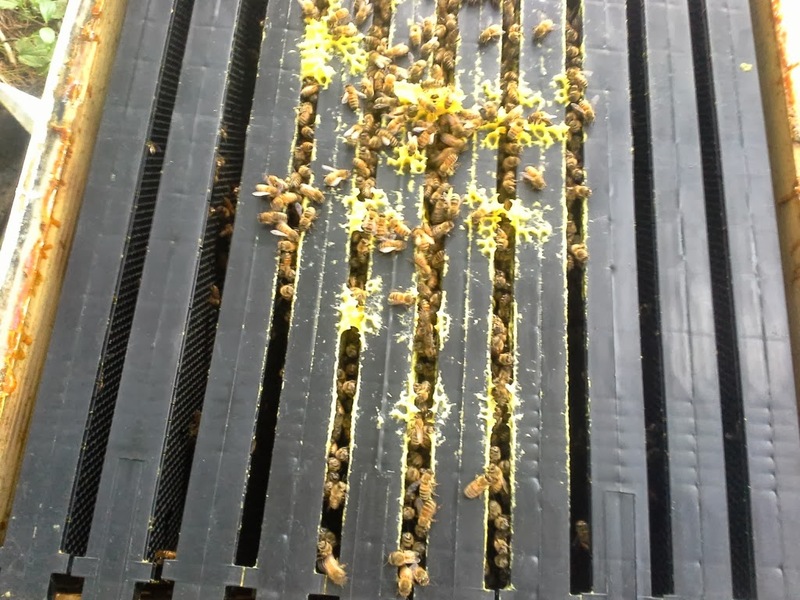 Reducing the space available to the cluster of bees is not always straightforward, especially if you utilized different sized boxes for your brood boxes and supers and the bees created a "chimney" through all the boxes. You could just take off the super and let them overwinter on the boxes below. A modification of this approach would be to raise the super above the inner cover (you may even scratch some of the cappings) and let the bees rob it out and store the honey in the broodnest. Alternatively, you could try feeding your hive 2:1 sugar syrup (or 5:3) in an effort to help the bees finish out the super and leave it for them to overwinter in. So, back to the worst case scenario - how to reduce the height of your stack if you have multiple sized boxes. If you have multiples of the same sized box plus an odd size, for example a deep plus couple of shallow supers or a deep plus couple of mediums, try to consolidate the multiples into one and feed to fill out the odd size. In the example above, you would consolidate the half-drawn mediums into one and feed to fill out the deep. If you have just one of each, then your best bet is to feed and let them sort it out. In conclusion, in order to give your colony the best chance of overwintering, you want to make sure your colony is queenright, pest and disease free (or those are within manageable limits), provisioned with enough stores to last it until the first available pollen in your locality, and the colony is housed in a box/boxes that are appropriately sized for the available population. Is my hive ready for winter? This is a very simple question, but the answer is long and complicated. I have prepared a small checklist that can help you evaluate your hives. Stores. You should be able to determine this without needing to open the hive. Just lift the back side of the hive. The rule of thumb is at least 150 pounds for a double deep or 70 pounds for a single. Good population. Here are pictures of one of my August nucs and one of my singles. I took those earlier today, Sept 21, 2013 at 5 pm. 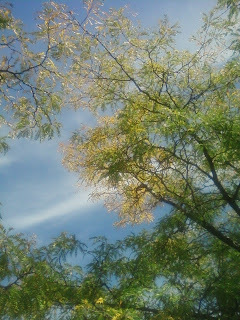 It was sunny, but cool, 61F. You should be able to see "seams" of 2 rows of bees between the majority of your frames with possible exception of the 2 outer ones. My camera does not do very nice close-up pictures, but you should be able to see the "seams" in the nuc picture and in the middle of the single picture. The "seams" of bees are not very visible between the rest of the frames in my single picture, but they are there. At this point, if I am happy with the weight of the hive and the population, I'll close it up and call it good. Why? I don't want to break any bridge or cross comb that is filled with honey and I don't want to start a robbing session. Most importantly, I don't want to chance damaging the queen. The queen is on this frame - here is a close-up. Can you spot her? She is a little bit above the center of the picture. This round of brood is just starting to emerge and the empty slots are already filled with eggs. Here is the second frame - just a little spot of brood emerging and the bees are quickly filling the empties with stores and capping. The last frame was just empty comb. This nuc is almost there as far as winter prep goes. We still have between 4 and 6 weeks of nice weather with daily temperature above 50F. They could raise at least another round of brood. Of course, they will need feeding. On my walk earlier this week, I noticed that the locust trees are getting tipped with yellow. Yes, fall is here already, so are your bees ready for winter? Do they have enough pollen/honey to last them through the winter? How do the bees themselves look? Are they queenright? How does the brood look? So, how exactly do I determine if my bees have enough stores to last them through the winter? The answer, of course, is that it depends. Bees in the southern parts of the USA need fewer resources than those in the northern parts. Beekeepers in Alabama, California, Florida and Texas usually overwinter their bees in a single deep or a single with a shallow super. Beekeepers further north or in higher altitudes usually recommend a double deep configuration. You need to make sure that the size of the colony is right for the size of the box they are in! In this location, NW Ohio, I have overwintered bees in singles, in doubles, and this winter, I am attempting to overwinter some in 4 frame double nucs. My honey producing colonies, 4 of them, are in a standard double deep configuration. I could not lift the back corner on 3 of them, which means they are way over their minimum 150 pounds of stores for winter. The last one was surprisingly light and, you guessed it, it got fed. My singles are the packages that I used this spring and summer for queen rearing and to make my nucs. For those, I aim for 70-80 pounds. Lifting wise, if all the frames have their comb built and they make me go "hmmmmpf", then they are good to go. My nucs were all made in late July/August. For those, I want to make sure they have at least 2 combs of honey/syrup. 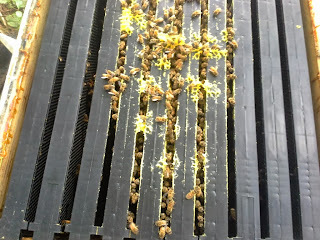 While checking the honey/pollen stores, I also looked at the bees themselves and the brood. It takes about 20 days for a worker bee to emerge after the egg is laid. So, right now, in September and October, my bees are raising the winter bees, or the bees that will carry the queen through winter and raise the first few brood cycles in the spring. So, if you are treating, or need to (I am not), now is the time to do it as you want those winter bees on the top of their game. Finally, make sure the hive is queenright. Do you see worker brood and eggs? If not, I like to use this hive's resources to boost my other hives. Beekeepers take their losses in the fall!